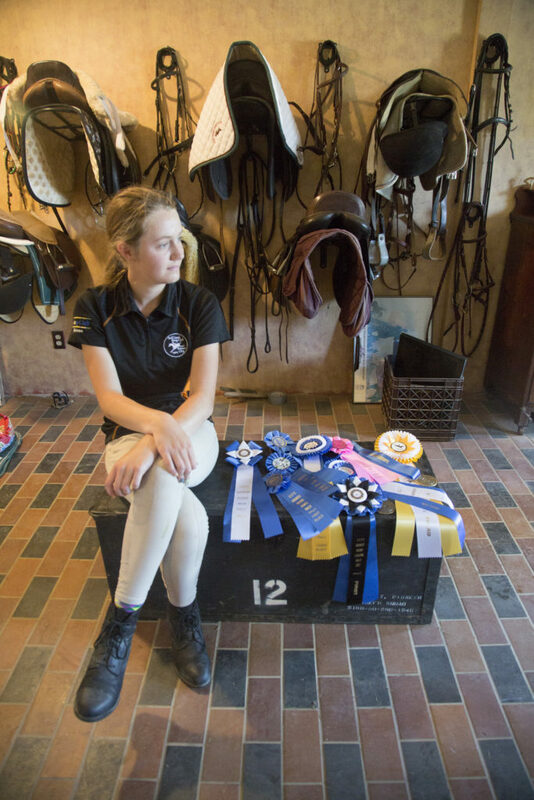 Fifteen-year-old Riese Wismer, a Baldwin High student, has found success in equestrian riding as her many ribbons show off her hard work though the years. Baldwin City ? Buddy gallops on the sand-covered course, his caretaker and owner, 15-year-old Riese Wismer, on his back. As they ride past an orange traffic cone, Riese, wearing a velvet tortoiseshell helmet, leans down and grabs a small wooden flag sticking out of it. Buddy doesn’t slow a bit. “Goo’ boy, goo’ boy,” she says, patting his neck. Riese does it so effortlessly you start to tell yourself, “Maybe I could do that.” But that’s what elite athletes do: make sports appear so easy armchair quarterbacks think they could be Peyton Manning. Riese, who just finished her freshman year at Baldwin High School, has accomplished quite a bit already in her young equestrian career. She is a member of the fourth-ranked U.S. junior equestrian team that recently competed for the national title in Lexington, Ky. She’s headed to Europe this summer after qualifying for the International Games Exchange. She hopes to one day compete in the Olympics. Riese picked up her love for horses from her mother, Kathy, a champion equestrian rider in her day. She always knew that if she had a daughter, she was going to introduce her to the sport. Thankfully, Riese loved it. She started riding equestrian when she was 3 or 4 years old, never looking back. She said equestrian teaches young people self-confidence, teamwork and how to better ride and respect their horses. In that last respect, equestrian is a long way from the rodeo and its bucking broncos. Riders like Riese take amazing care of, even pamper, their horses (more on that later). Riese competes in mounted games like quick turns and vaulting on the back of Buddy, the 16-year-old pony she has owned most of her life. She also does eventing (jumping, dressage, etc. ), but on a different horse. Earlier this month, the teen was part of the first-ever junior team to represent the Midwest at the Prince Philip Cup in Lexington. Its name? The Mustang Sallies. Riese’s success in the U.S. Pony Club, the junior equestrian organization, also earned her one of the five spots in its International Games Exchange trip to the United Kingdom. She will travel there for two weeks this August to learn more about European equestrian riding and, at the end of her stay, compete against her fellow participants. Riese practices for an hour each morning at a fenced-in equestrian course next to her house, an idyllic setting in the woody hills of rural Baldwin City, where she lives with her dad, David, a programmer for the Federal Aviation Administration, and mother, Kathy, a photographer. On a recent day there, the sun beat down as two dogs chased each other around the property, which is dotted with chain-adorned baskets that serve as the holes for disc golf (David’s preferred sport). Riese, her posture straight, rode Buddy, taking turns picking up cans off upside down trash cans or grabbing empty milk cartons off poles. Riese seemed more concerned with how Buddy was doing than her own performance. During their practice round, she kept checking to see whether he was sweating. She talked to him and stroked him like he was a family pet rather than a 1,000-pound competition horse. When they got back to the family’s horse stable, she hosed Buddy down before brushing the water off him. “Cooling down the horse is not the application of water. It’s getting it off,” she explained. “He’s the best pony,” Riese said, feeding him a carrot.